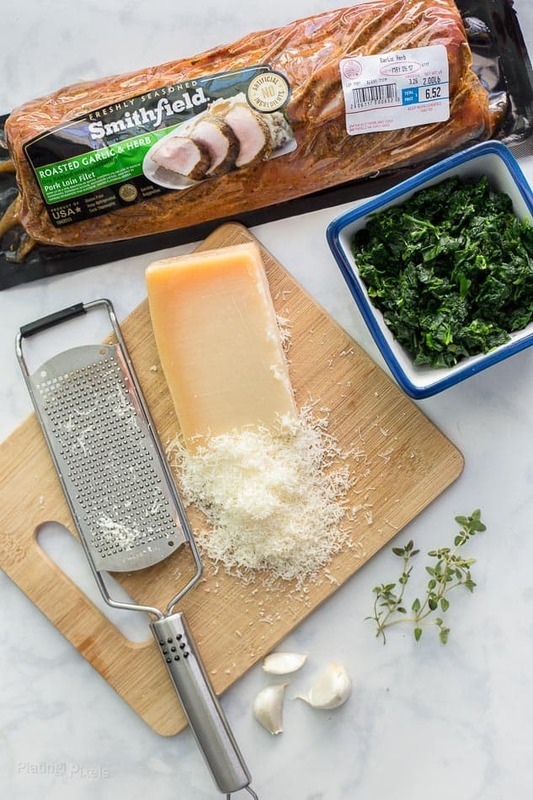 Spinach Parmesan Stuffed Pork Loin makes an easy weeknight dinner in 30 minutes. 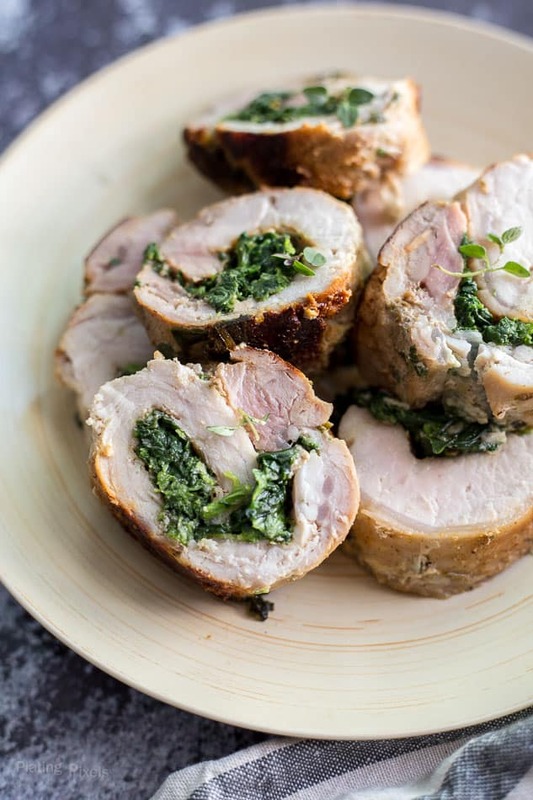 Tender pork loin filled with spinach, ricotta garlic and herbs. I’ve been cooking more at home recently. You’d think I would all the time with a food blog, but a full time job and other arrangements can easily prevent that. There’s a lot of advantages to home cooking, especially when you can easily make recipes like this Spinach Parmesan Stuffed Pork Loin. Cook a little extra and you’ll have leftover lunches without much extra effort. 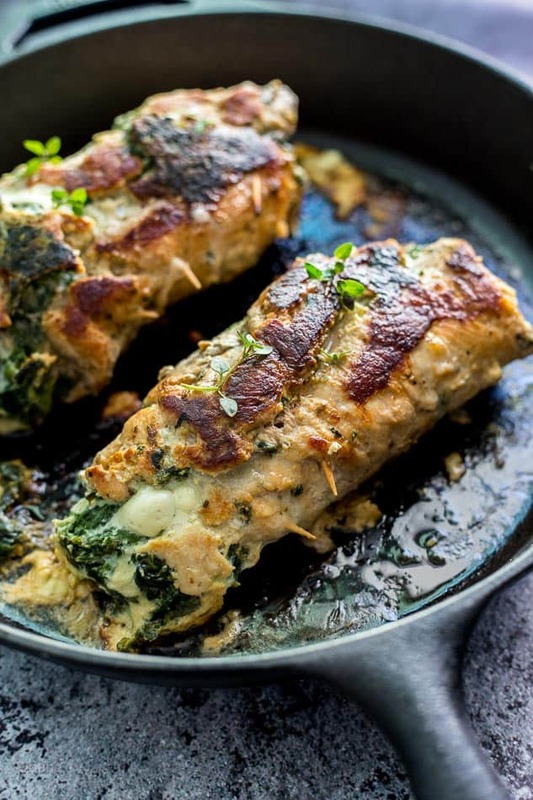 These Spinach Parmesan Stuffed Pork Loins can be made easily anytime, even on a busy weeknight. All you need is about a half hour and a Smithfield Roasted Garlic & Herb Loin Filet. It’s pre-marinated, so you can cook as is or modify like I did in this recipe. 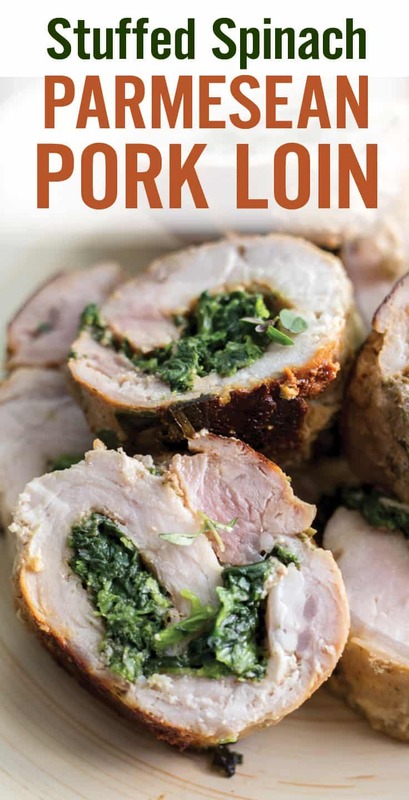 Made with 100% pork, a lean loin is an easy way to get lots of protein and change up your menu easily. Because the pork loin is flattened and then stuffed it cooks much quicker than a whole unstuffed pork loin. Always make sure to brown the pork on all sides and then bake it, covered for around 10-15 minutes. To be sure the pork is cooked all the way through check it with a meat thermometer and make sure it reaches 145F. The most important step to getting juicy pork is to make sure it rests after cooking and don’t cut into it until it has rested. If you cut into pork straightaway all the juices and flavors will run out resulting in a dried out pork loin. If you make sure to rest the pork for around 10 minutes after cooking the juices will soak right into the meat making it juicy and full of flavor! Another important tip is to not overcook the pork so make sure to use a meat thermometer to check when the pork is done. Stuffing pork loin is very easy but you will need some kitchen twine to hold it all together. Simply spread the filling over the flattened pork loin and roll it up tightly from one end to the other. All that’s left to do it tie it up with kitchen twine to make sure it doesn’t unravel during cooking and you’re all set! This stuffed pork loin is as simple as filling, rolling and cooking. A rich and creamy mixture of ricotta and Parmesan cheese, garlic and fresh thyme is rolled between tender pork loin. Brown and cook in the same pan, and in less than 30 minutes you’re ready to serve. Cut into slices to showcase the beautiful spiral center, full of flavor. Use Smithfield Roasted Garlic & Herb Loin Fillet, it’s already marinated and full of flavor. This will make sure your meal is super delicious with less effort. Use frozen spinach to speed things up. Use a meat thermometer to check the pork is cooked through. Make sure to rest the meat so it’s juicy and flavorful. Fresh thyme has a much stronger flavor than dried so try to always use fresh. Serve the pork with roast potatoes, salad or grilled vegetables. Flavor profiles: Cheesy and savory, with garlic and herb undertones. Texture: Tender pork filet with a creamy cheese filling. Cut loin filet in half vertically. Place one piece in sealed ziplock or wrap in plastic wrap. Use a mallet to flatten to about ½-inch thick. Repeat process for other piece, set aside. Cook spinach according to package directions. Drain excess liquid with a fine mesh strainer, pressing to remove as much liquid as possible. In a medium bowl, combine spinach, both cheeses, garlic and thyme. Evenly spread mixture over flattened pork loins, up to about ½-inch from edges. Tightly roll from one edge then wrap and tie with kitchen twine. Heat olive oil to medium-high heat in a large nonstick pan or skillet. Add pork loins and cook 5-8 minutes, until browned. Rotate and brown other side, about 5 minutes. Reduce heat to medium, cover and cook until internal temp reaches at least 145°F., about 10-15 minutes (rotating if needed). Remove from pan and let sit 10 minutes. 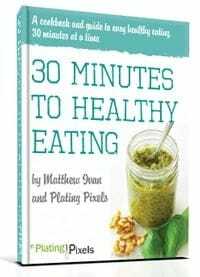 Slice into 1-inch thick pieces and serve. Use Smithfield Roasted Garlic & Herb Loin Fillet, it's already marinated and full of flavor. This will make sure your meal is super delicious with less effort. Make sure to rest the meat so it's juicy and flavorful.